Come play with Elmo in his play room! Introducing the latest offering from the wizards at Dvik & Joyrex, a game designed specifically for toddlers and pre-schoolers (ages 1 to 6)! Elmo of Sesame Street is hiding in his play room, and he wants to play a game of peek-a-boo with you! 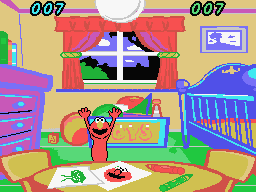 This game offers two play modes, one for toddlers (where Elmo pops up whenever the player presses any direction on the joystick or any button on the controller) and another for pre-schoolers (where the player is required to push the joystick in the direction where Elmo appears, within a short time limit). Elmo actually speaks in this game! Come and play with Elmo! This project took off and reached its conclusion quite quickly. 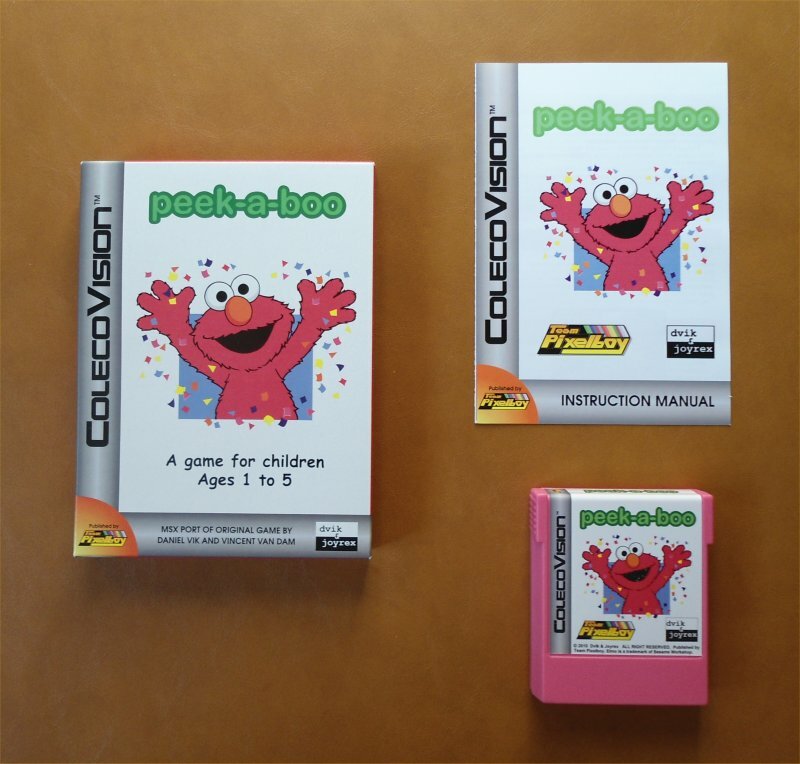 I had 50 unused dark pink cartridge casings, and I knew that Daniel Vik (of Dvik & Joyrex) wanted to create a ColecoVision version of their Peek-a-boo MSX game. So when I told him about the 50 dark pink casings, he immediately went to work on the port, and after a few days of beta-testing, the software was done and ready. 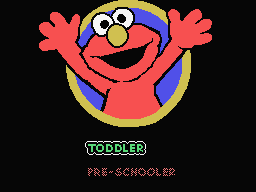 Aside from the cute graphics, the nicest feature of the game is Elmo's voice. The speech samples are really nicely done, and for that alone, I'm very proud to publish this game on the ColecoVision, on Dvik & Joyrex's behalf. SPECIAL THANKS: Jean-François Dupuis, and all AtariAge forum members. 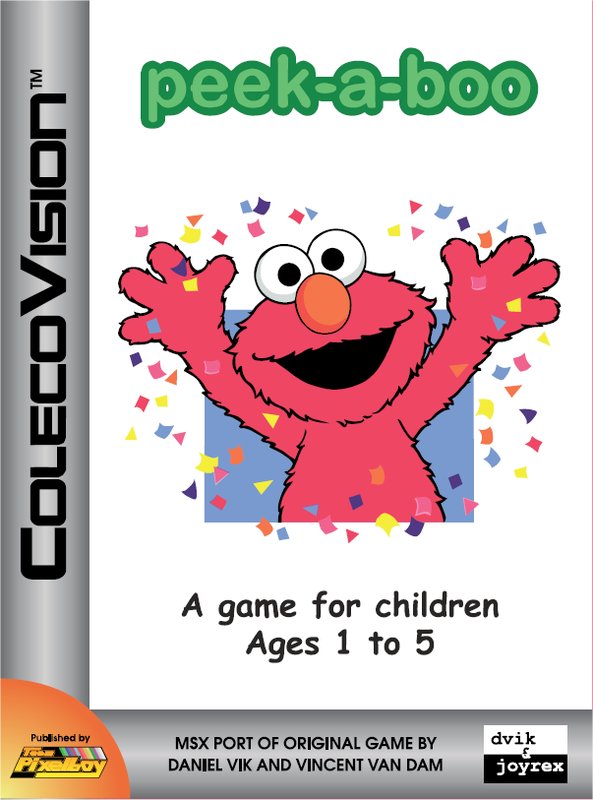 Here is a YouTube video of the ColecoVision version of Peek-a-boo.